If you want to have fun the next time you use Skype, try to use a voice changing program. These tools can help you change your voice when calling your friends or stage a fake sore throat even if you’re feeling completely well. The AthTek Skype Voice Changer is a flexible voice changing program that you can use to change your voice playback into a different, unrecognizable tone. You can also interchange different sound effects to create funny voice changes. The app supports recording Skype calls in high quality audio format. Pros: Free to download, supports accent changes, with lots of voice changing options, simple UI. Cons: Reported bugs in saving calls. 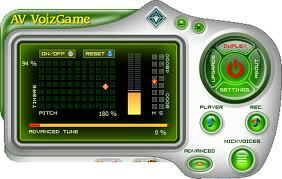 The AV VoizGame is made especially for online game chats. 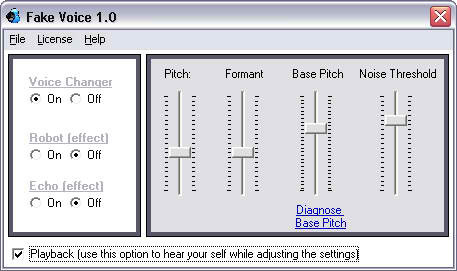 The software can alter voice outputs through different sound packs. Aside from using it on online game chats, the software is also useful in instant messaging applications like Skype and Yahoo Messenger. Pros: Comes with a 14-day free trial, flexible voice changing features, simple UI. Cons: Costs $29.95 to download. Fake Voice is a voice changing program that you can use before making a Skype call. It will alter your voice to produce a different voice output. It can change a male voice into a female voice output and vice versa. Adding echoes and robot effects are also supported. Pros: Supports modification in echoes, simple UI, easy to navigate. Cons: Costs $19.95 to download, limited voice changing options. The Skype Voice Changer is especially made for Skype voice calls. The software will let you modify the playback of your voice into something else. 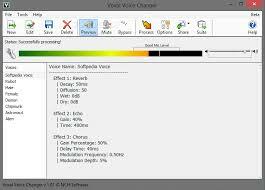 You can choose from lots of voice and sound effects available in the software. Pros: Free to download, simple UI, lots of voice and sound effects available. Cons: Interchanging voices while on active conversation is complicated. The Voxal Voice changer program is useful in adding special voice effects to your usual voice playback. 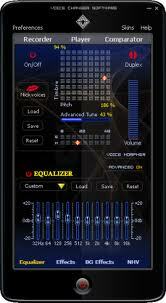 It can add echo, pitch, chorus, reverb, flanger and distortion effects to your voice. It works well with the most common chat software like Skype. Pros: Free to download, comes with many voice-altering solutions, easy to use. Cons: Some USB microphones are not recognized by the software. 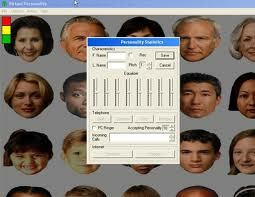 Virtual Personality is a voice changer utility made for Windows. It can be used on Skype and other IMs to conceal your accent and voice quality. It has 24 individualized voices that you can use in interchanging your voice. Pros: With 24 individualized voices, works with telephone lines. Cons: Costs $28.45 to download, complicated UI. 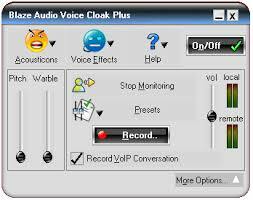 The AV Voice Changer software can do a wide range of voice changing features for different IMs and in-game voice chats. It can also work well with audio recorders and audio editor programs. In using it for Skype calls, the software has a specialized section for Skype-specific functions. Pros: Packed with features, works with other IMs, compatible with online gaming voice chats. The Blaze Audio Voice Cloak Plus will let you modify your voice playback by changing gender voice, enabling robot voice and supporting pitch, echo and EQ shifting. You can experiment with different sound effects to create your desired sound output. You can also save voice cloaks you made as presets for future use. Pros: Equipped with lots of options to modify voice output, supports saving voice cloaks as presets, with 5 band equalizer. Cons: Costs $49.95 to download, complicated UI. 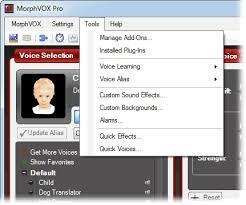 MorphVOX PRO is an intermediate program for Skype. It has an incredible voice changing algorithm that will let you change your voice not only in Skype but in other IMs and online gaming chats as well. It has hundreds of voice selections and sound packs available and you can further modify each one to meet your preference. The app also has Backgrounds feature which you can use to change the background noise of your call. Pros: Compatible with other IMs and online gaming chats, with superb voice changing quality, allows modification of background noise. Cons: Costs $39.99 to download.